How Neil Gorsuch avoids saying absolutely anything of substance. Can Neil Gorsuch Answer a Question? On Day 2 of his Supreme Court confirmation hearings, it remains unclear. Judge Neil Gorsuch testifies during the second day of his Supreme Court confirmation hearing before the Senate Judiciary Committee in Washington, D.C.
Neil Gorsuch is eloquent, savvy, and principled. But can he answer a question? 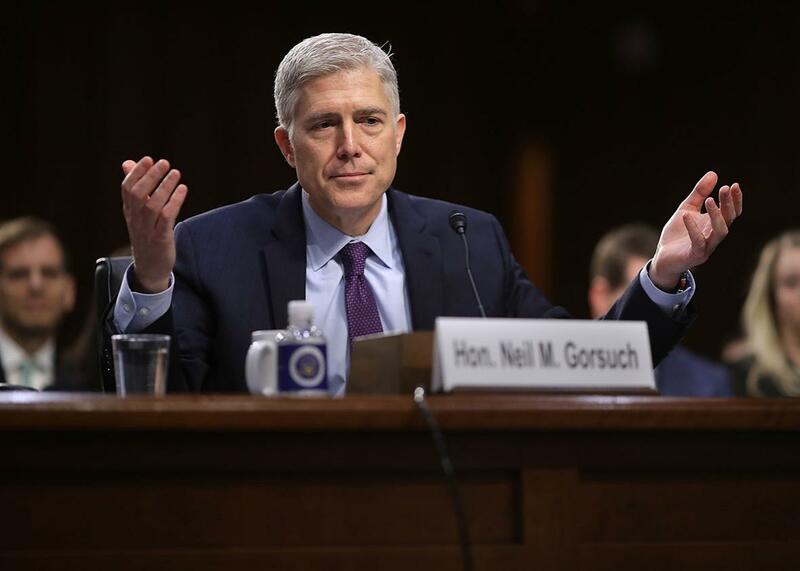 Several hours into Tuesday’s Senate Judiciary Committee hearing on Gorsuch’s nomination to the Supreme Court, the answer remains unclear. Gorsuch has smiled and quipped. He has frowned and mused. He has brooded, hedged, dodged, vacillated, hesitated, temporized, and mulled. What he has not yet done is directly answer a substantive question posed by a United States senator. Will he? Can he? That mystery is becoming the central drama of these hearings. To be sure, Gorsuch has spoken a great deal. He has spoken about judging and what makes a good judge. (Politics bad, independence good.) He has spoken about impartiality and the need for an open mind. He has spoken about precedent and how judges should follow it, except when they shouldn’t. He has spoken about the importance of patience and collegiality. He has deployed witticisms and aphorisms that coruscate with good-natured sophistication. But thus far, he has not offered real answers to real questions. Republican Committee Chairman Chuck Grassley set the stage for Gorsuch’s equivocation by reminding him at the outset that he wasn’t allowed to talk about cases. Or law. Or process. Or politics. He then proceeded to grill Gorsuch about his views on the Second Amendment, the right to counsel, religious freedom, Roe v. Wade, and Bush v. Gore. Gorsuch passed Grassley’s test by refusing to say anything about any of them. Democratic Sen. Dianne Feinstein then took a stab, asking Gorsuch about Roe and a series of recent 5–4 decisions in which the Supreme Court ruled against victims of workplace discrimination. Did Gorsuch agree or disagree with any of these rulings? Did he have thoughts on them? None that we deserve to hear, apparently. “If I indicate my agreement or disagreement with a past precedent of the United States Supreme Court,” Gorsuch said, “I’m signaling to future litigants that I can’t be a fair judge.” By Gorsuch’s definition, commenting upon a case necessarily involves indicating his agreement or disagreement. Want to know Gorsuch’s thoughts on employers’ rights? Sorry, you’ll have to wait until he has life tenure on the highest court in the land. Later, Democratic Sen. Patrick Leahy brought up Shelby County v. Holder, in which the Supreme Court’s conservatives gutted the Voting Rights Act. When Gorsuch wouldn’t provide an opinion, Leahy looked puzzled. Compounding the oddness of this situation is that Gorsuch is on the record questioning firmly established precedent. Most famously, as a judge on the 10th U.S. Circuit Court of Appeals, Gorsuch wrote an opinion questioning the wisdom of so-called Chevron deference, which requires courts to defer to executive agencies’ reasonable interpretations of law. In a remarkable concurrence, Gorsuch essentially called for Chevron to be overruled, an unusual move for a lower court judge. But when asked about Chevron on Tuesday, Gorsuch demurred. Under the klieg lights, his anti-Chevron fervor mysteriously evaporated. After the lunch break, the situation did not improve, although Gorsuch did add a Socrates quote to his stable of diversionary chestnuts. Chief Justice John Roberts didn’t say much of substance during his confirmation hearings, either, but at least he pretended to care about going through the motions. Gorsuch, by contrast, already looks frustrated that senators have the gall to ask him questions about the law. His mask is starting to slip. And if Democrats turn the heat up, they might even trick him into answering a real question.